Softer water will once again flow from taps in west Cumbria after complaints about a new, harder blend. United Utilities has been adding harder water from boreholes to the traditional supply of soft water from Ennderdale, which is running low. This led to reports of "popping kettles" and complaints about rashes, mouth ulcers and upset stomachs. The company said "numerous" safety tests had been carried out but to allay concerns it was altering the balance. Copeland's Conservative MP, Trudy Harrison, was among those who lobbied United Utilities for a change, and a petition was also set up. Mike Starkie, Copeland's elected mayor, said: "Our residents have been very concerned over the changes to the water supply, and many have been unhappy about the 'harder' water they are receiving. "I am pleased that our drinking water will be a softer blend, balancing the wishes of the community with the environmental impact." Martin Padley, from United Utilities, said: "We made the original changes to the supply to meet a requirement to reduce the amount of water taken from Ennerdale and so improve the ecology of the River Ehen. "All our tests have consistently shown the water to be of the usual high quality, but we have taken on board the concerns of our customers who said they didn't like the harder water. "I'm really pleased that we have been able to arrive at a compromise which will allow us to keep the amount of borehole water in the blend to a minimum, while still providing benefits for the local environment." 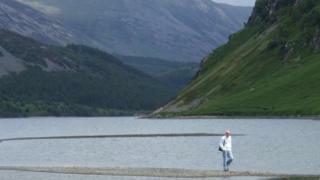 The company will stop taking water from Ennerdale once a £300m pipeline from Thirlmere Reservoir is complete in 2022.